With an overwhelming need for skilled laborers, as well as the need to retain talent, many of our clients have taken a step in a completely unexpected direction: the same direction. Manufacturers who once were in competition for skilled professionals are now coming together to source talent and ideating on ways to improve the longevity of employees in their facilities. Two heads are better than one: Companies in similar hiring locations are making the commitment to “change the way we do business” by teaming up to source the same professionals that they once competed, sharing notes, and moving forward as a united front. Manufacturing is cool: Rather than wishing and hoping for skilled laborers to magically appear in the job market and even respond to job ads, manufacturers are going out of their way by participating in movements like “Manufacturing Day” to show young professionals that manufacturing isn’t what they thought. Manufacturing is a platform for innovative minds to come together and make something, with a goal of improving the lives of all of mankind. This proactive approach should yield a surge of manufacturing workforce professionals in years to come. Manufacturers offer career paths -not jobs: Accepting a job at a manufacturing company doesn’t mean that you have to be a __(insert position name here)_ forever. Accepting a job at a manufacturing company means that you have stepped in a career where the company invests in their people by providing paid training opportunities. Many manufacturers are even thinking outside of simply offering benefits and beginning to offer an “employee experience”. This experience includes health centers, onsite gyms, and even childcare assistance. 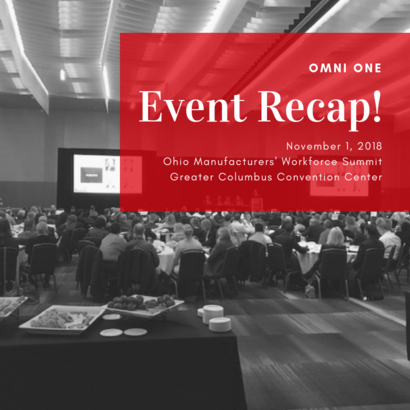 Omni One is committed to joining the conversation and is partnering up with area manufacturers to improve the war on talent. As a full-service manufacturing recruiting firm, we not only place professionals and help companies fill their open roles, but we provide consultancy at absolutely no charge. Teams work better when they work together, so why not let us help you grow your team?